Would you like to get more use out of your outdoor space in Hilton Head, South Carolina? At Porch Outfitters, we’ve been helping homeowners do exactly that since 1987 by offering a wide range of beautiful and functional porch enclosures. When you partner with us, you’ll get exactly what you want from your outdoor space, whether that’s a pool enclosure to keep dirt and debris out of your pool or simply a place to relax and enjoy time with friends and family. Porch Outfitters is proud to offer premium sunrooms from the industry-leading manufacturer TEMO. These enclosures are built to last with a fully extruded aluminum construction and exceptionally durable TEMKOR surfacing. They even come with a lifetime warranty, so you’ll get to enjoy your outdoor space for as long as you own your home. Plus, they come in a variety of styles, including studio, cathedral, and solarium, to work with your home’s architectural design. Porch Outfitters custom-builds screen rooms in virtually any size and configuration to meet your specific needs. We only use the most durable materials and are one of only a small number of companies to adhere to the strict guidelines set forth by the Aluminum Association of Florida. What’s more, we use specialty screening made from vinyl-coated fiberglass to provide the best possible protection against pests, such as no-see-ums. 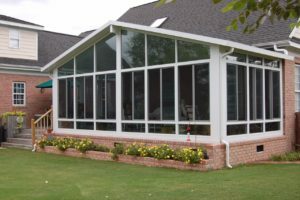 No matter which of our porch enclosures you choose to have installed at your home in Hilton Head, SC, you can have peace of mind that it will be installed with precision and care, as we provide a lifetime workmanship warranty on all projects. Contact us today to learn more about our services.